Wilfrid Laurier University is proud to present the award for 2017 Equitable Life of Canada Co-op Student of the Year to Arielle DeHaw, a fourth-year student in the Honours Bachelor of Business Administration program, in recognition of her outstanding achievements in her co-op work terms, in service to the community and academically. Laurier gives this award annually to a deserving student in Laurier’s co-operative education program, after reviewing nominations from employers and co-op coordinators. Laurie Brown, her co-op coordinator, is confident in DeHaw’s ability to promote Laurier’s objective of “Inspiring lives of leadership and purpose”. Brown considers DeHaw’s consistent support of the Laurier community and impeccable work ethic among her notable qualities. DeHaw has completed the three work terms required of her co-op program. In her first role as a marketing innovation intern with Dare Foods, she created research development briefs and analyzed opportunities for new product launches. 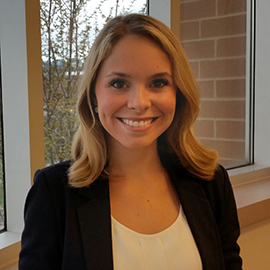 During her final work term last winter, DeHaw expanded her knowledge of video technology as an intern with the business development team at Vidyard. On campus, DeHaw has worked hard to maintain a strong academic standing while also participating in volunteer initiatives. She has enthusiastically supported the fight against Cystic Fibrosis as a sponsorship coordinator for Laurier Shinerama, where her efforts in corporate sponsorships and the silent auction helped to raise more than $10,500. As the vice president of marketing for Laurier’s Economics Club, De Haw spearheaded a successful networking event and mentored the executive team. DeHaw’s drive to exceed expectations has resulted in numerous awards and scholarships, including the President’s Gold Scholarship, awarded to those with an average grade of A+, for three consecutive terms. She recently received the BMO Financial Group International Academic Exchange Scholarship, for which she participated in an academic exchange in Pamplona, Spain. It can be difficult to balance work, academics and extracurricular activities; it is even more of a challenge to excel in all of these roles simultaneously. With her friendly demeanour and winning smile, DeHaw continues to inspire others with her dedication, willingness to learn and work ethic. Laurier offers the largest co-op business degree program in Canada. For more information, or to hire a co-op student, please visit wlu.ca/co-op, call 519.884.0710 extension 4484, or write to lauriercoop@wlu.ca.